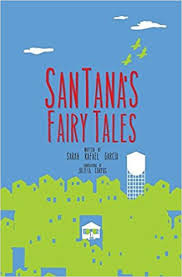 Storyteller and visual artist Sarah Rafael García offers six “Fairy Tales for Trust and Justice,” all of them set in Santa Ana, a city in southern California that borders “the happiest place on Earth.” But that place is “never happy” for the brown people who live and work there, who live in fear of the landlords, the police, and ICE. In the first story, “The Carousel’s Lullaby,” we see the stakes, as teenager Saul remembers the carousel where he reunited with his parents after their separate migrations across the border, where he and his younger brother spent so many joyful weekends until Señor Billy Spurgeon, the real estate developer, tore it down to make way for shops and restaurants for rich Anglos. One night, Saul sneaks out to hear the ghost of the carousel, and never comes home—one more unarmed person of color killed by police. I am an enchanted woman named Zoraida. But of course you already know my name. You knew me when I was alive. In this life, I reign from far, far above the castles and queens. I travel by whispers, wished upon the North Star and hushed weeps. Just like you called upon me in midst of bloody murmurs, wishing for death to ease the pain. Some call me death, others the Godmother of life. In my last life I too thought it was my fate to die as a woman on a night like tonight. But death came just too soon, leaving me trapped between others’ lives and my own. While Saul and Zoraida lose their lives to the supernatural ogres and beasts that represent forces of repression, the resourceful and resilient children of the next two stories, “Just a House” and “Hector and Graciela,” manage to outwit those who would steal their happiness and their lives—though not without great loss. Josefina’s nemesis in “Just a House” are Anglo gentrifiers turning their close-knit community into a playground for the wealthy (hers is the unhappy mother toiling in that artificially happy place). Graciela and Hector’s parents debate how to tell them that ICE threatens to destroy their family. Graciela, the older one, tries to protect her younger brother, but he is far more aware and clever than she gives him credit for. Readers will note the parallels between this story and the Grimm fairy tale “Hansel and Gretel,” including the ogre that lures the children with food. Soy una mujer encantada de nombre Zoraida. Pero claro que ya sabes mi nombre. Me conocías cuando aún estaba viva. En esta vida, gobierno desde lejos, muy por encima de los castillos y las reinas. Viajo por medio de susurros, deseos pedidos a la Estrella Polar, y llantos silenciosos. Así como tú me invocaste enmedio de murmullos sangrientos, deseando que la muerte aliviara el dolor. Algunos me llaman Muerte, otros, la Madrina de la Vida. While SanTana’s Fairy Tales was created for general adult readers, its focus on young people resisting oppression, coming of age, and coming into who they are makes this a compelling choice for teens. It’s highly recommended.